G1, also known as Mayall II, orbits the Andromeda galaxy (M31), the nearest major spiral galaxy to our Milky Way. Located 170,000 light-years from Andromeda's nucleus, G1 is the brightest globular cluster in the Local Group of galaxies. 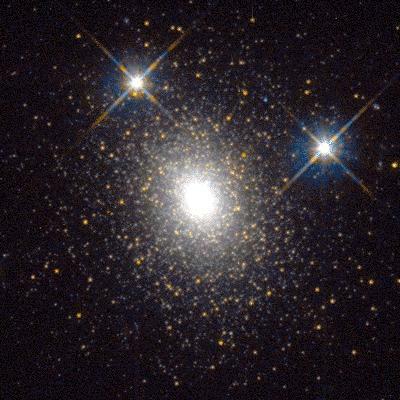 At a distance of 2.9 million light years, it shines at 13.7 mag visual magnitude, and is thus visible as tiny patch in large amateur telescopes. 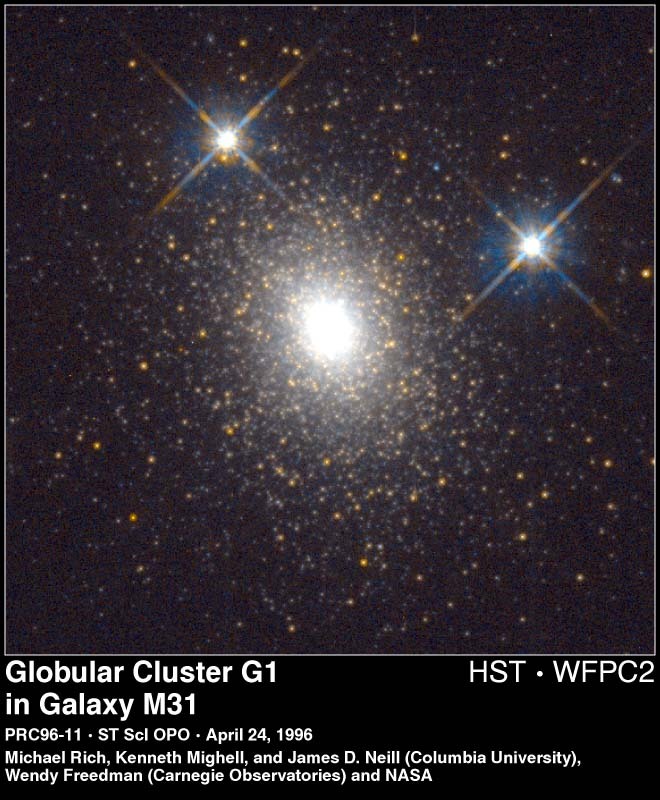 The cluster is also known as SKHB 1 (for Sargent W.L.W., Kowal, C.T., Hartwick, F.D.A., Van Den Bergh, S., who named it G1; Sargent et.al. (1977)), and HBK 0-1 (for Huchra, J.P., Brodie, J.P., Kent, S.M. ; Huchra et.al. (1991)). The crisp image is comparable to ground-based telescope views of similar clusters orbiting the Milky Way. The Andromeda cluster, however, is nearly 100 times farther away (and thus 10,000 times fainter). Of this image, high resolution (300 dpi) JPEG images are available in color [722k] and black&white [552 k]. A magnification of the double nucleus of M31.